Daniel Kahneman and David Bohm are two of my favourite experts on human thinking process. Kahneman, in his bestseller “Thinking, fast and slow”, tells us that one of the key characteristics of our (fast) thinking is “associative coherence”. On the other hand, David Bohm, in his “Thought as a system”, tells us that the most important characteristic of our thought process is “sustained incoherence”. Coherence vs incoherence - Are they talking about the same thing? Or different things? That’s what I would like to explore in this article. Associative coherence: When the news of Aarushi Talwar’s murder in Noida broke out on TV in 2008, my parents were visiting us in Bangalore. I remember watching the news on Rajesh and Nupur Talwar, the high profile doctors in Delhi, a possible affair between their daughter Aarushi and their servant Hemraj and a possibility of “honour killing” etc. My mother who was watching the TV with me, declared within minutes of seeing the news that the parents have committed the murder. I don’t remember what was more shocking to me – the news or my mother’s confidence in her verdict. This is a classic case of how we (including I) form most of our judgments. What matters is whether the pieces of information available to us fit together as a story – i.e. does the story make sense? Do these pieces cohere associatively (together)? What gets ignored is the quantity (adequacy) and quality (correctness) of information. This is what Kahneman calls “associative coherence”. The fast thinking machinery is habituated to jump to conclusions based on the coherence of the story – like a “mental shotgun”. Kahneman calls this “confidence by coherence”. Sustained incoherence: I returned to the Aarushi case when I read the book Aarushi by Avirook Sen a few months back and also saw the movie Irrfan Khan starrer Talvar a couple of weeks back. I liked the way Avirook Sen has presented various threads of the case – how sloppily the evidence was collected immediately after the murders, how CBI handled the case and how the verdict was arrived at by the Judge Shyam Lal in CBI’s fast-track court in Gaziabad. It looked like a good case material to study cognitive biases in action. Let’s take Judge Shyam Lal whom Avirook visited three months after the verdict. During the discussion, Avirook came to know that the report writing had begun a month before the judgment pronouncement date – Nov 25, 2013. The interesting thing is that the final arguments of the counsel for the defence (Tanveer Ahmed Mir) began on Oct 24, 2013 and went on for two weeks. In these two weeks Tanveer would argue on a total of 24 circumstances that he felt should lead to acquittal. However, looks like the Judge had already made up his mind and perhaps the evidence didn’t matter. Once you believe in something (e.g. Talwars are guilty) then your thinking process automatically supresses the the evidence which might prove it otherwise. We sustain the potentially incorrect information or incoherence in order to maintain our belief. David Bohm calls this “sustained incoherence”. Note that we do correct misinformation in many places. For example, when you come to know that your friend’s email or phone number is changed, you update the entry in your contact list. Bohm calls this "simple incoherence". However, we don’t seem to correct the misinformation in many other cases including the cases where our self-image is at stake. Are the two concepts – “associative coherence” and “sustained incoherence” inconsistent? Not really. In fact, Kahneman calls “sustained incoherence” cognitive illusion – where thought creates and sustains a gap between perception and reality. In part III (chapters 19 to 24) of “Thinking, fast and slow” Kahneman presents various cognitive illusions including illusion of validity, illusion of understanding, illusion of skill etc. He says that cognitive illusions can be more stubborn than visual (optical) illusions and they lead to overconfidence. After our recommendation, my parents saw the movie Talvar last week. I asked my mom what she thought about the case now. She said she is confused. That shows that beliefs are hard to change but not impossible to shake up. 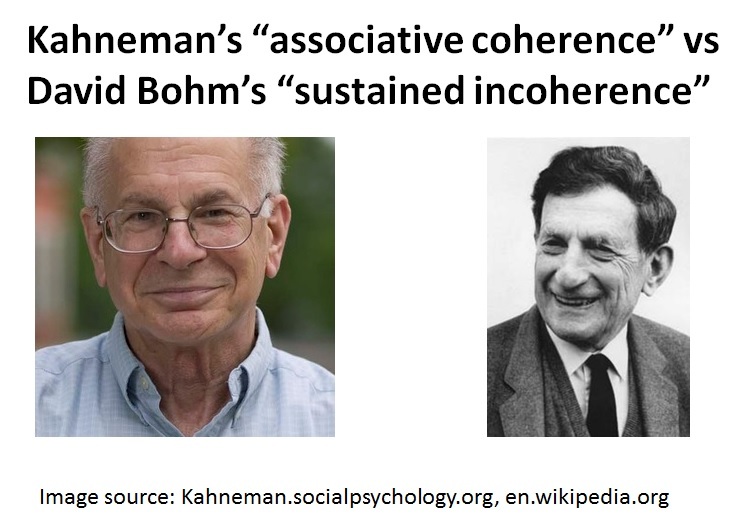 In summary, Kahneman's "associative coherence" and Bohm's "sustained incoherence" are consistent. “Associative coherence” – how well the connected pieces of information make sense, is the basis on which we form opinions. And once we form an opinion, we suppress the evidence that proves it wrong – thus we sustain the potentially incorrect information – called “sustained incoherence”. This creates overconfidence.